Today for part two of our Halloween Home Tour I am sharing the room that is the heart of our hive. I feel like I pretty much spent 90% of my day in my kitchen. Because I spend so much time here, I wanted my kitchen to be bright and cheerful. I love how the bright white and pops of color lift my mood. Even during the spookiest season I wanted to keep the bright colors and fun decor. I hope you like it. Remember my table centerpiece that I've slightly changed throughout the year to keep it seasonal. Here it is dressed up for Halloween. It's that time of year again! Time to plan what your kiddos will be this Halloween. I usually have something in mind that I'm dying to start making, but this year I'm struggling to come up with something. If any of you are in the same boat I wanted to share one of my favorite DIY costumes with you today. Don't you just love scarecrows? How could you go wrong with your little one in a painted nose and cheeks? It is just too much! I can't take the cuteness! 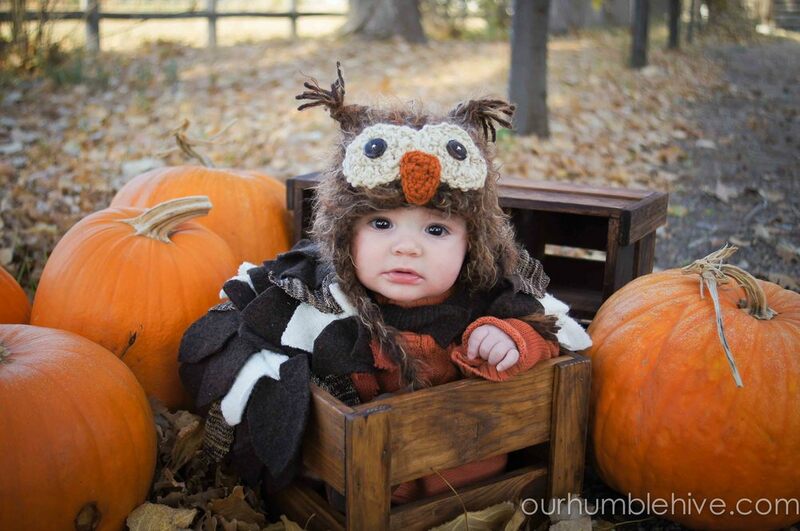 The picture above and below are my Baby Bumblebee dressed up in his scarecrow costume. I have to admit, I was fully prepared for him to refuse to wear the hat and itchy arm and leg bands. I was very pleasantly surprised that he loved them and refused to take them off. I love the fact that a scarecrow costume is simple, inexpensive (you can use a lot of things your child already owns) and nice and warm. I think you can tell from the picture how to basically put this costume together, so I won't go in to too many details. One thing that I came up with was an easy way to make the "straw" for under his hat and on his legs and arms. I found a woven raffia roll that looked like a table runner from Hobby Lobby in the ribbon section near the burlap. It was simple to pull out the weaved in raffia and make it stick out like straw. I then glued it on to velcro that I could attach around his wrists and ankles. The picture below was one of my inspiration photos for his costume. Isn't this adorable. You can find the link to more pictures of this little scarecrow here. 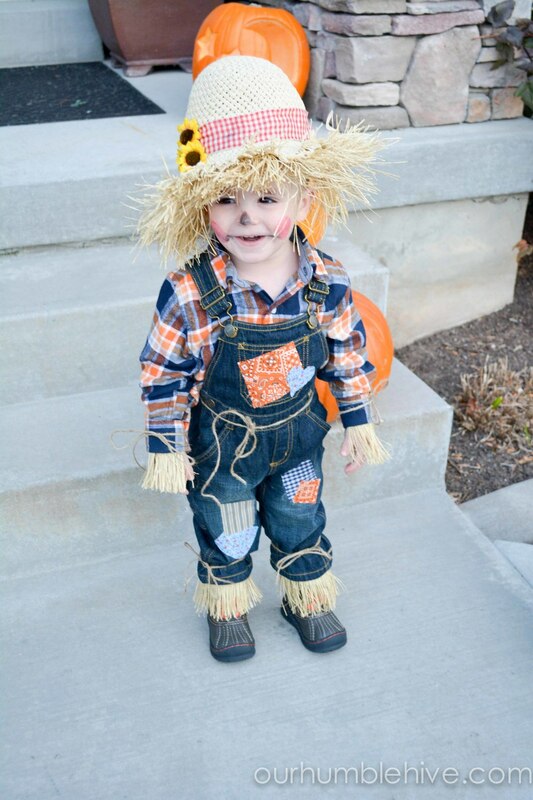 Isn't this sassy little scarecrow as cute as can be? I love this idea for warmer weather trick-or-treaters. You can find this costume here.